Your way, O God, is holiness; what god is as great as our God? Who is so great as our God? No one. Nothing can be compared to Him. He is supreme over all. What’s really interesting about this Bible verse is where it’s found – in Psalm 77. There, the psalmist writes of confusion and discouragement. It seemed as if God had turned a deaf ear to his cries. He poured out his heart. Have you ever felt like that? Wondered, God, are you there? Are you listening? I know I have! But you see, in the midst of such uncertainty, the man or woman of God has this truth to cling to: there is no one like our God! It is to be expected that there will be things within God’s bigger picture we cannot understand. Often we will have to wait for God’s plan to unfold more fully to appreciate His presence and providence throughout. This knowledge – of God’s ultimate greatness – ought to influence us today and every day, serving as foundation for life, faith and hope. What do you say? Father, these things I know: You are Author and Finisher. You never leave me nor forsake me. You neither slumber nor sleep. Will You help me to trust in You today – Your greatness over and above all? Grant me renewed faith; the assurance of things hoped for and the conviction of things not seen. 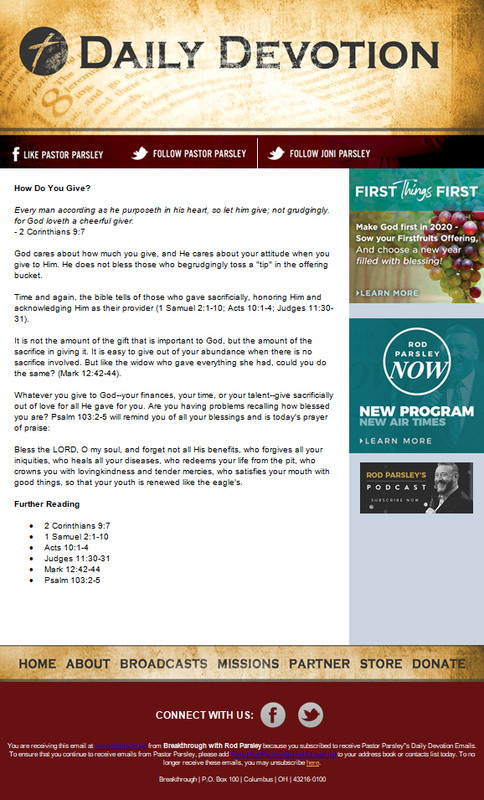 Receive these powerful devotionals and Pastor Parsley's daily prayer directives right in your inbox.